As graceful as a tai chi master. I’m sitting here editing a the big pile of images from my recent China commission, going through it methodically, day by day. Right now I’ve just being taking a look at some images I shot early one morning in Zizhuyuan Park, in Beijing, and it reminded me of a joke I said to my fixer, Felix, that I was working with, whilst shooting the images. I was watching all these people doing their early morning tai chi exercises, moving gracefully, balancing, pirouetting, making slight adjustments of the foot, the leg, their hands and twists of their wrists, then a sudden but controlled movement and then back to calm. It was beautiful, to use an old line, poetry in motion, to see this grace under the trees and in the early morning air. As I watched them through my viewfinder I thought to myself, when I’m looking through the camera and making slight adjustments to my distance or proximity to the subject, bending my knees, leaning over slightly to adjust composition, raising up on my tiptoes to gain that extra little vantage point of height, in my mind when I make those adjustments to my stance I am moving as a tai chi master. I float gracefully around my subject, barely making the air ripple, my every move light and soft, considered, adding to my image. 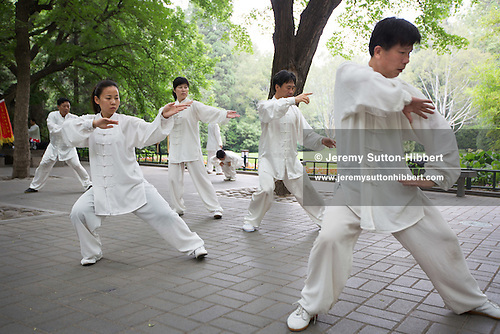 Early morning Tai chi in Zizhuyuan Park, in Beijing, China. ©Jeremy Sutton-Hibbert 2012, all rights reserved. Onwards with the editing, there are 2 weeks worth of non-stop shooting to go through.